The substance was called Quicksilver. It over took 95% of the world and transformed it into a wasteland overnight. It reacted with water and spread rapidly, depending on which person you ask some would say this was a blessing for humanity others would call it a curse, and naysayers would call it the apocalypse. Quicksilver moved at a steady pace turning everything it touched into something that it was not and something that others would call the true nature of an item or species. 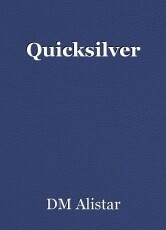 There were several categories of creations that came out of Quicksilver: Deformity, Reformity, Infectoids, and Reducers. Deformities were known as the monstrosities, they came in all shapes or forms. Some were no bigger than a quail others were as grand as a skyscraper. They took shape only after it has had contact with a natural substance from the earth. Life-form or inanimate objects, Quicksilver gave new life to creatures of the earth, and breathed life into objects that held value at one point to humans, or even gave new life to those objects that have waited patiently in the bowels of the earth to rise again to terrorize the earth. It did not matter Quicksilver was the lifeblood of Deformities, they could manipulate their shape and mimic life to a point of so convincing that some have even tried to conform to humanity, or at least what was left of it. Reformities were those of Quicksilver that seen itself as the salvation of humanity and began converting life form or inanimate object into a new creation or succumb to the oppression that was Quicksilver, or die. The Reformists was the name given to those of humanity that were "converted" either willingly or unwillingly, it did not matter they lost all hope in what was left of humanity and became followers of an infection that became known as Quicksilver. Reformities were the prophets of a gray ribbon-like parasite from beyond the stars. Something humanity was never prepared for due to their own naivety. Reformists were known to possess the ability to transform or "convert" a life form or inanimate object into a vessel of immense power, but had no consciousness of its own. Infectoids were the Quicksilver's agents of destruction. It is rumored that most of the conversion of the earth was done only by Infectiods. From the moment Quicksilver touched the atmosphere of earth Infectiods broke off and landed in several crucial areas on the surface of the planet. They would dive to the deepest depths of the ocean and begin to transform and take in the nutrients that were so abundant in the ocean, that it only took moments before it would spread to the nearest life form or inanimate object and change its structure into a new Infectoid that uses the raw materials of the earth to spread. It takes only moments before the new Infectoid and spread once more. Reducers are nothing more than an over glorified queen bee. They are Juggernauts, giants of an alien parasite; they are the truest form of Quicksilver. They work as the matriarchs of Quicksilver, being the hub of most operations that houses the Quicksilver. They produce the natural state of Quicksilver and are the strongholds that keep the planet in its wasteland state. They also were launched mid-space of the atmosphere of the earth. Hitting all the major cities on the face of the planet; which are now the major concentrations of Quicksilver Abominations. © Copyright 2019 DM Alistar. All rights reserved. Very well imagined concept. Enjoyed reading this. Thank you I plan on uploading more writings as time goes on. Please enjoy!